Through the years of production, the manufacturer used numbers for carburetor identification. Very early Quadrajets had tags installed into a cast round area on the drivers side of the main body. In and after about 1968, stamped numbers were used for identification. 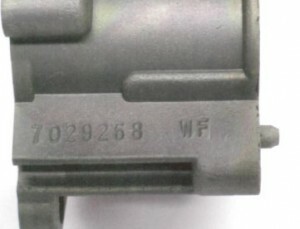 The large flat area on the main body just above the secondary throttle shaft has a series of numbers stamped into the casting. In most cases these numbers can be used to identify the year and application the carburetor was originally used on. After 1975 Carb will have an 8 digit code starting with 1 – i.e; 1704.. The 5th number is either a “1” or “2,” indicating federal (49 state) emissions, or a “4” or “5” denoting California emissions. The 6th number indicates the division application. “8” is Checker and Marine. The last number indicates the exact application. For the most part, even numbers were used on automatic transmissions, and odd numbers on manual transmissions, but there were numerous exceptions. Staring in the 1975 model year, a “1” was placed in front of the “7” followed by “705.” The “1705” series of carburetors would run until 1979. Beginning in 1980, the first four numbers were changed to “1708,” and this number series would continue until the last carburetors were produced in the late 1980s. Plant codes identify which plant the carb was cast at. Usually two or three letters and the date that the carburetor was produced. They may be located with the stamped numbers. On 1966 built Carbs they are on the round tag. 68 and later they are on the casting as shown here “WF”. 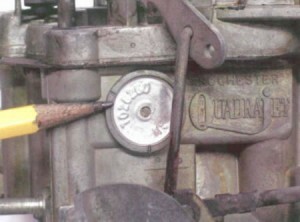 Most Rochester built Q-jets used a four-number Julian date. The first three numbers are the day of the year the carburetor was built; the last number is the year. Carburetor number 17058201 followed by a Julian date of 1238 would have been built the 123rd day of 1978. One must keep in mind when dating carburetors that the year of production may not always be the same year as indicated by the carburetor number. Quite a few service replacement carburetors were produced. It is quite common to find much later production dates then what is indicated by the carburetor number. In addition, Carter carburetors produced in the late 1960’s may have been used in a different model year then the number shown on the carburetor. This was most common in the 1968-1969 models. Rochester was not able to keep up with production. Many Carter Quadrajets produced in these years may have been carried over to the next model year. This information is most important to restorers. It could be correct to have a fully restored 1969 Pontiac GTO using a Carter Carburetor produced in 1968. It is important to note that there are quite a few exceptions to the basic numbering we have described above. One should always give a carburetor a close visual inspection. With rare high-performance carburetors bringing in excess of $2,000.00, there are always those who are going to re-stamp low-performance units.